New clients often ask me what got me started in massage therapy. One moment in particular comes to mind as instrumental in my decision to study bodywork and the healing arts. As a junior in college, I studied abroad with a program called Semester at Sea. This program travels the world for four months, with a cruise ship as campus and home base. We disembarked from Vancouver in September and proceeded to journey to ports throughout the world: Japan, China, Hong Kong, Vietnam, India, Turkey, Israel, Ukraine, Morocco, Egypt, and finally New Orleans. The trip from Vancouver took about ten days as we headed northwest past the Aleutian Islands off the coast of Alaska and into the open ocean. Ocean nights were unlike anything I had ever seen before. The inky black of the sky arched from horizon to horizon like a dome, illuminated by millions of brilliant stars that seemed to pierce through from somewhere beyond. The “awesomeness” of Nature’s power became more clear each day as we entered this rolling water world free of any human markings, buildings, or familiar context. Some mornings the ocean was calm and smooth, other days the water whipped and spit into the air. We went a week without seeing another ship at all-just empty horizon and the company of Nature. Our reintroduction to the world as we knew it came the day before we arrived in Osaka. From the bow of our ship we spotted a bright light on the horizon. An old boat was miles from shore, outfitted with giant metal scaffolding on either side, bedecked with banks of lights blazing into the water. After days on the empty waters their boat looked like an alien craft with wings of light, just settling on the ocean for a brief drink. We usually stayed in each country for about three days, with 1-3 days of travel time on the ocean in between ports. We only had class during our time on the ship, so during our stay in each country we were free to travel independently or hook up with a group or guided tour. By our third port, my mind was reeling. Within two weeks we had landed in Japan, China, and Hong Kong; each country with a fundamentally different cultural framework and national aesthetic. Profoundly different choices in how to live, what to believe, what was deemed important in life. The rhythms of daily life, even the pulse and flow of transportation, varied from place to place. In this world of sudden differences, some part of me began looking for common ground. In retrospect, I believe that traveling on the ocean was instrumental in my confusion. It took time to get to each country, and to get there we always entered the world of water and sky, where the last country was left behind, and the next one had not yet emerged on the horizon. I incubated for several days with my impressions and experiences from the country we had just left. Then, slowly, a shape would appear and coalesce into a new land, a new country, and a new cultural consciousness that I had “learned” about but never felt in my bones before. We landed in Ho Chi Minh City on a sweltering day. The local newspaper had announced our impending arrival, and merchants swarmed the docks to welcome us to their economy. As I stepped from the boardwalk of the ship onto the pavement, I was aware of the crushing heat and the crush of jostling bodies all around me. The combined effect felt like being in an outdoor sauna. Within minutes, my kneecaps started sweating, which I had never known was possible. I didn’t know that kneecaps could sweat, and I don’t know if they have sweated since, but my entire body worked feverishly to cool me off. Brian has always been interested in the power and mystery of the healing process. As an undergraduate at the University of North Carolina at Chapel Hill, he majored in Sociocultural Anthropology and studied indigenous healing systems. 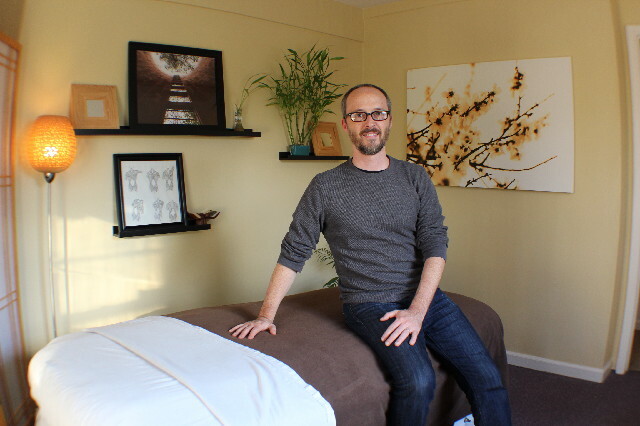 Brian began his massage training in 1999 while working on staff at the Omega Institute for Holistic Studies in Rhinebeck, New York. After moving to Nashville to start a family, he graduated from the Natural Health Institute for massage therapy in 2003. In 2009, Brian completed an intensive three year Healing Science Training Program with The School of Healing Arts at The Estuary in Nashville. He is ordained as an independent Minister in the state of Tennessee. School of Healing Arts Six Year Graduate program at The Estuary in Nashville, Tennessee. Besides his private practice, Brian has also served as an instructor at Natural Health Institute and Genesis Career College in Nashville, Tennessee. He has taught Myofascial Release, Kinesiology and Deep Tissue Massage, Eastern Anatomy and Physiology, and Chair Massage.